The timeline component is a powerful multi-track component that allows layering and crossfading a number of sounds together, linking the timeline and volume/pitch curves with game parameters. A timeline component can be added in the hierarchy by selecting the Fabric->Components->Timeline menu option. A timelime parameter provides the link between the game and the timeline internal functionality. With a parameter it is possible to trigger regions that are placed in a layer as well as control property/parameter graphs. A timeline parameter can be controlled using the event trigger component or through the API. When a timeline parameter is set to Reset On Play it means that every time the timeline plays again the parameter resets back to its last position. When a layer has a controlled parameter selected it displays a blue vertical bar in the timeline view. The length of the timeline is mapped to the range of the parameter. It is possible to select the parameter bar and drag it left or right or use the slider displayed in the timeline inspector view. A layer is added into the timeline by right clicking into an empty region and selecting the “Add Layer” option. A layer provides a timeline in which multiple regions can be inserted. When two or more regions overlap a crossfade is applied. A region defines an area in the timeline in which any component will be activated when the parameter cursor is entered, and stopped, according to the “On Exit” behaviour, when is exited. A region can be added by selecting anywhere in the layer timeline and right clicking. A region provides a number of properties. For a detailed description of each property please refer to the reference manual. 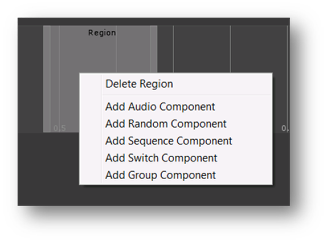 When a region is created it is possible to right click on it and add any of the Fabric components shown in the context menu. On each layer it is possible to add property/parameter graphs that allow to link and control a layer property from a timeline parameter such as volume and pitch. It is possible to add points in the graph by right click on the line. It is also possible to define the type of curve for the line between two points. A point can be deleted by selecting on it and pressing the mouse right click.